This document is for use by the person(s) designated to approve(moderate) which emails may be sent to a restricted email list. It includes the steps to follow when reviewing an email that is sent to such an email list. It also discusses rules and alternatives for attachments. 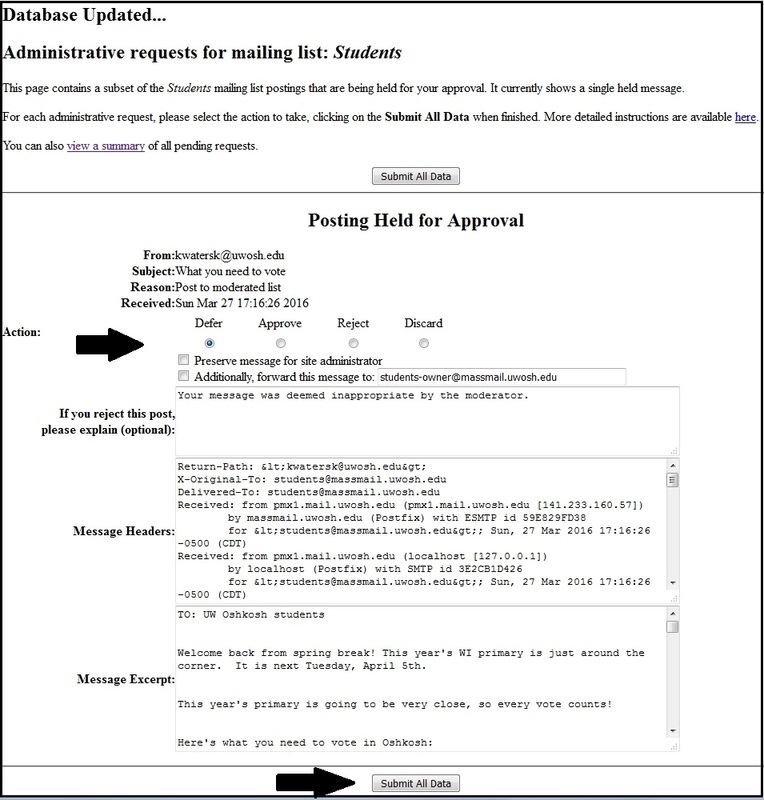 An email notification will be sent to the email moderator for approval. Such attachments are not permitted and should be Discarded due to that the server must store a copy of the attachment for each email address that is on the mail list. 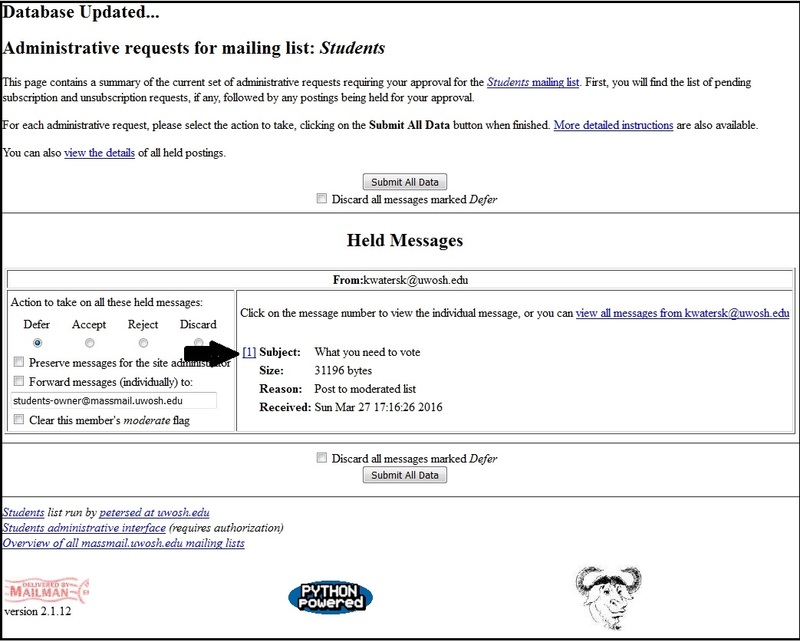 When considering the number of addresses in any given campus-wide email list, this can be a significant amount of server space. Add a link to a webpage that contains the desired information. Insert a file using TitanApps Drive (the icon for this is located just to the right of the attachment paperclip at the bottom of the 'TitanApp's Compose New Message' window. Open the email notification for moderation approval. 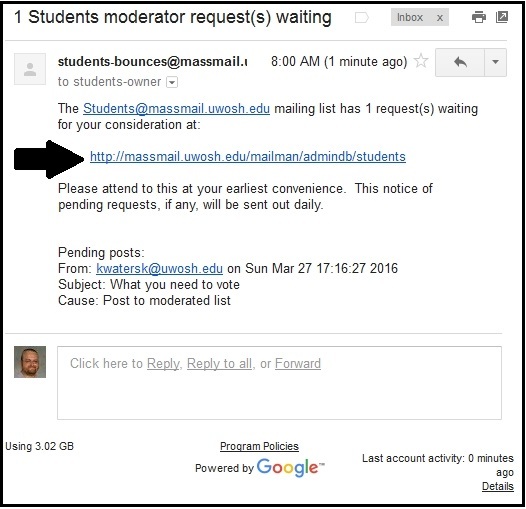 This email will include the URL to the list's pending request page. Navigate to the Held Messages area. Click on the number just to the left of ‘Subject’ (there may be more than one, always approve in chronological order, which is indicated by the Received heading). Review the content of the message. Optional Review: Depending on the way it was sent, it may be in a format which is not easily readable in the preview. In this case, leave the selected action at "defer"
Click "Submit all data", that message will be sent only to your address for you to review, and it is still held in the list manager software for your later approval. Select the appropriate radio button in the ‘Posting Held for Approval’ area. • Defer – Nothing will happen and the request will still be pending moderation. 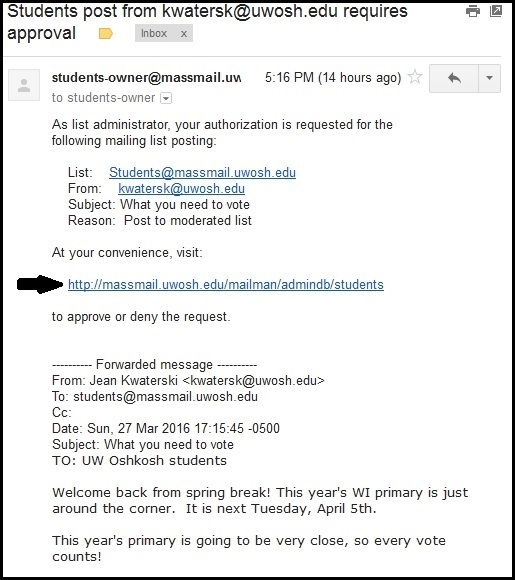 • Approve	– The email will be sent to the email list. Click on the Submit All Data button. Continue moderation until you see the following message which indicates there are no emails left to moderate.